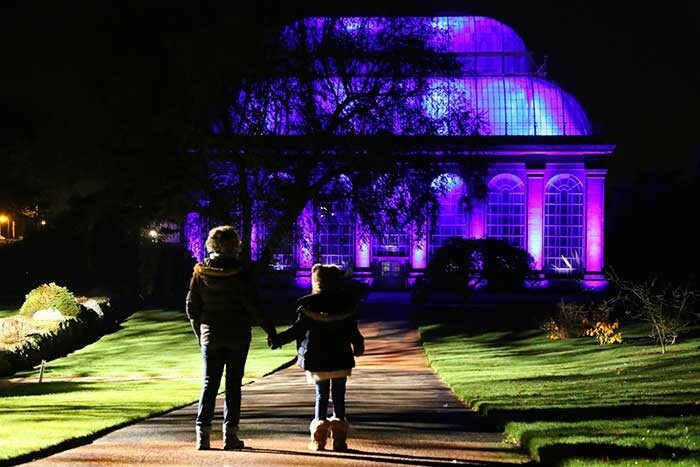 UK – In celebration of all things natural and nocturnal, night time visitors to Edinburgh's much-loved Royal Botanic Garden (RBGE) saw the familiar landscapes and buildings transformed by a magical light installation during November. 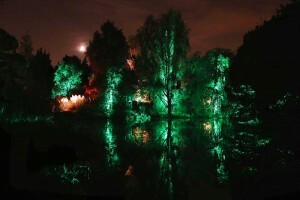 Designed by light artist Malcolm Innes, along with his colleague Euan Winton and supplied and installed by light solutions specialist Black Light the aptly named 'Night in the Garden' invited people to visit the gardens after dark to view and interact with an inspired display of light, art and nature. The initiative was designed to bring a fresh sense of place and perspective to a familiar attraction and was two-and-a-half years in the making. It was made possible through the partnership of Royal Botanic Gardens, Edinburgh Napier University, Unique Events, Event Scotland, via Homecoming Scotland 2014, and Black Light. "This installation was as much about dark as it is about light," explains Malcolm Innes, a light art and projection artist, lecturer and researcher at Edinburgh Napier University. 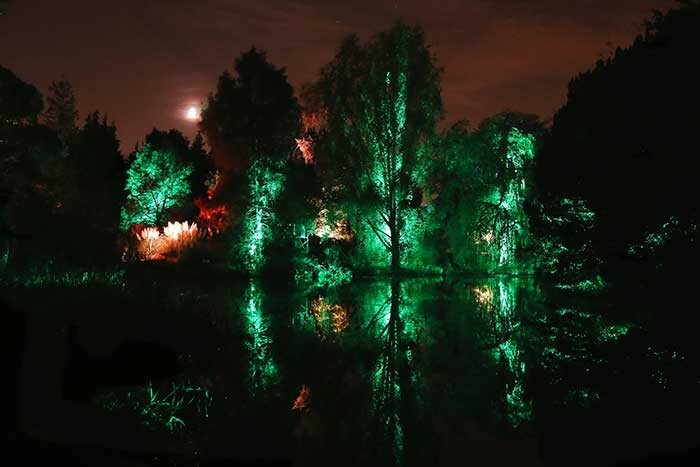 "The Botanical Gardens is right in the heart of Edinburgh City so finding true darkness here is almost impossible. Our installation was designed to use different light angles, colour and movement to amplify the darkness and at the same time alter how people see the more familiar daytime features when surrounded by darkness. By careful positioning of lighting fixtures and manipulation by programming we can mask familiar landmarks and emphasise other features that would not necessarily stand out during the day. Black Light and I have worked together over some years and as ever the inventive Black Light team has helped me really focus my creative ideas by offering realistic and practical technical solutions to satisfy the overall artistic concept." The resulting event was enchanting. Black Light's Calder Sibbald, head of hire and event, elaborates: "Malcolm came up with a simple but effective design for the various parts of the gardens. It was our job to translate that design into the most appropriate lighting fixtures. Importantly, we also had to map the best way to run all the power distribution and lighting control elements of the project without causing damage to the rare and valuable plants or disrupting the daytime use of the gardens. And of course we had the added challenge of the outdoor environment and the changeable Edinburgh weather." Black Light supplied an extensive list of lighting and sound equipment, alongside control systems and power distribution. "Many of the various lit features around the route required their own control system," explains Sibbald. "These were programmed on an ETC Gio and the cue stacks were then loaded into ETC Nomad Pucks, which then cycled the show throughout the evening." Key areas of interest included a high impact, vibrantly lit, somewhat surreal, high hedge lit by a number of Green HQI Floods. Just a little further on was the impressive Georgian glass Palm House where the lighting concept created a sense that the sun is captured within it, rising and falling over a four minute dynamic lighting sequence. The imposing building was lit externally by a number of Robe CitySkape 48 LED units while inside Black Light used a combination of LED and tungsten ETC Source Four fixtures to project onto a huge disc hung in the centre of the house. Studio Due CityColor LED units and Briteq Power Pixel 8s created a general feel of slowly morphing colour-ways that ran from dawn to day to dusk to moonlight. 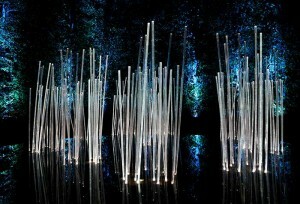 Visitors could then walk through and past a variety of smaller installations until they arrived at the large pond. Here, a cycled dynamic show saw weather-protected Robe Robin MMX Spots, housed inside Airstar inflatable domes, dance across the water like eerie 'crane like' creatures. Black Light also installed fountains which occasionally bubbled up to distort the reflected images of the slow colour-morphing trees and shrubbery that surround the pond. All of this runs in sync with an evocative musical score created by Haftor Medboe from Edinburgh Napier University. Beyond the pond the route took visitors around a number of other attractive feature areas and installations before arriving at Inverleith House. Here, former Napier University students – Double Take projections – projection mapped slowly peeling wallpaper patterns, effectively turning the inside out, across the whole face of the building. 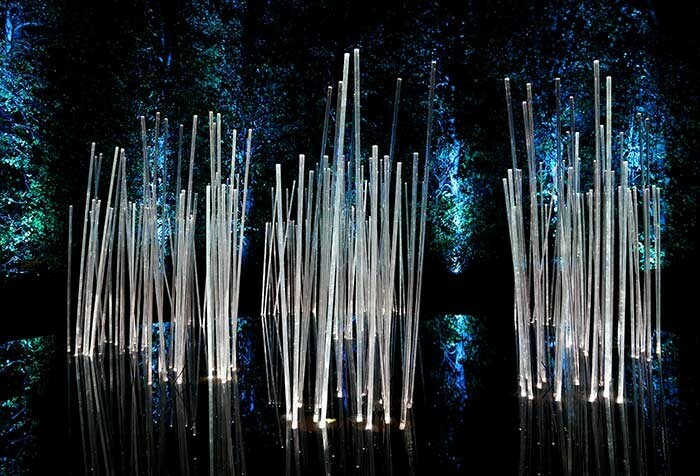 The installation concluded at the Pool of Serenity where a plethora of illuminated Perspex rods of varying heights were installed in an ornamental pond, backdropped by high hedges lit in striking dark greens and blues. Peter Irvine, director of Unique Events is delighted with the outcome: "Black Light was the ideal partner for this event. The company's technical team are skilled and resourceful, exactly what a project like this needs. We had been working on Night in the Garden for many months and at times it was a complex event to orchestrate. When it came to the lighting we were looking for a partner that we could rely on to understand what was required, be flexible, responsive and creative and be on time on a ridiculously tight budget! Having Black Light on board as our partners has given us exactly that." In addition to specifying and installing the fixtures, Black Light also provided technical support for the event, which ran until 23 November 2014.